I have been on a journey of unlearning for several years now. This trek has taken me inward, on a search for the ancient language that connects me to the wind, the ocean, a tortoise and birds, the stars, humanity. This strange interior pilgrimage included the shedding of layers of learned fear, replaced by the embrace of inter-being, the extraordinary interconnectedness of all things in this universe of marvels and oddities, astonishments and magnificence. 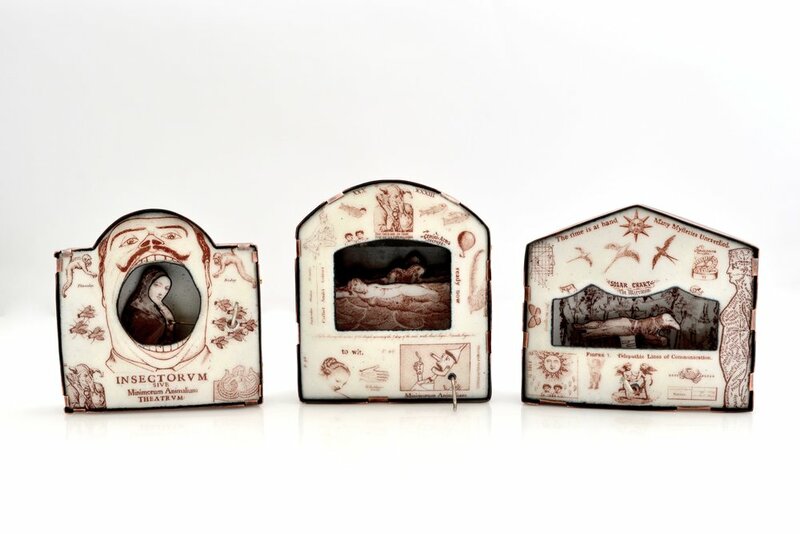 I weave this ethos through my jewelry and object art using a magpie approach, composing antique imagery, text and figural toys, which pepper small theatre-like frameworks. My layered narratives in glass and metal extend a helping hand, an invitation to see the world with curious eyes, the eyes of a child. You are often invited to turn a tiny crank handle which activates movement in the work, to become a magician for a moment, an alchemist in reverie, a shaman dreaming the world. It is a very sacred game we are playing here on earth. Each of my pieces can function as a touchstone, a cairn, a talisman, for soul retrieval, for awakening, for the journey back to remembering. I think of each as a miniature navigational atlas to the world behind this world, the unseen, the unheard, the unknown. From April 8-13, 2019, the Museum of Arts and Design will present LOOT: MAD About Jewelry, its annual exhibition and sale featuring designs from more than 50 emerging and acclaimed international jewelry artists. Now in its 19th edition, LOOT has become known as the ultimate pop-up shop for contemporary artist-made jewelry, where collectors and jewelry enthusiasts have the rare opportunity to meet and acquire pieces from some of the most innovative creators in the field. Adorned Spaces, a juried, multiple-exhibition, sale event to be held at the 2019 SNAG conference in Chicago, will highlight both established and emerging artists and celebrate innovations in metalsmithing. Twenty different pop-up galleries will occupy the State Ballroom at the Palmer House Hilton during the conference on Thursday and Friday, May 23 and 24, 2019 from 10:00 a.m. – 6:00 p.m. Additionally, a special closing reception and sale will be held on Friday, May 24, from 5:00PM – 8:00PM. Curator Lieta Marziali will have a pop-up exhibition entitled In Search of the Found and will show her work alongside pieces by mentor Robert Ebendorf, rounding out the exhibition with work by Spanish jeweler Jordi Aparicio and myself. “Alchemy” is a term that refers to a seemingly magical power of transmutation as well as the ancient chemical philosophy of turning base metal into gold or silver, can apply to enamel as it is magically transformed by heat. Alchemy 5 is the 17th Biennial International Juried Enamel Exhibition sponsored by The Enamelist Society. 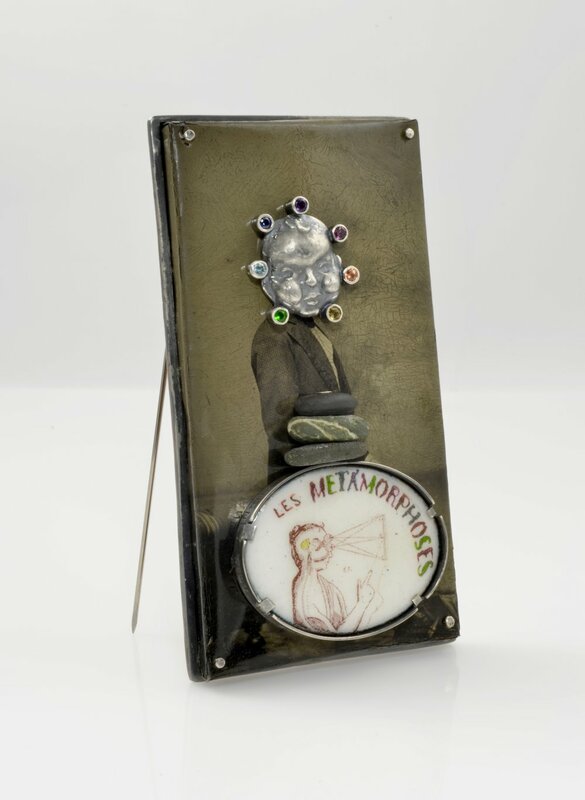 The Exhibition highlights the best in contemporary enamels produced in the last two years, showcasing the work of enamelists that demonstrate aesthetic and technical expertise. The Exhibition will be hosted at the University of Oregon in Eugene, from July 31 – August 7, 2019 and then will travel to other venues including the Museum of Glass in Tacoma, WA. .The wonderful world of enameling—fusing glass to metal under high-temperature conditions-- is diverse! Practically anything made from enamel-friendly metal can be enameled, from vases to jewelry to buttons to metal mesh and solid forms. 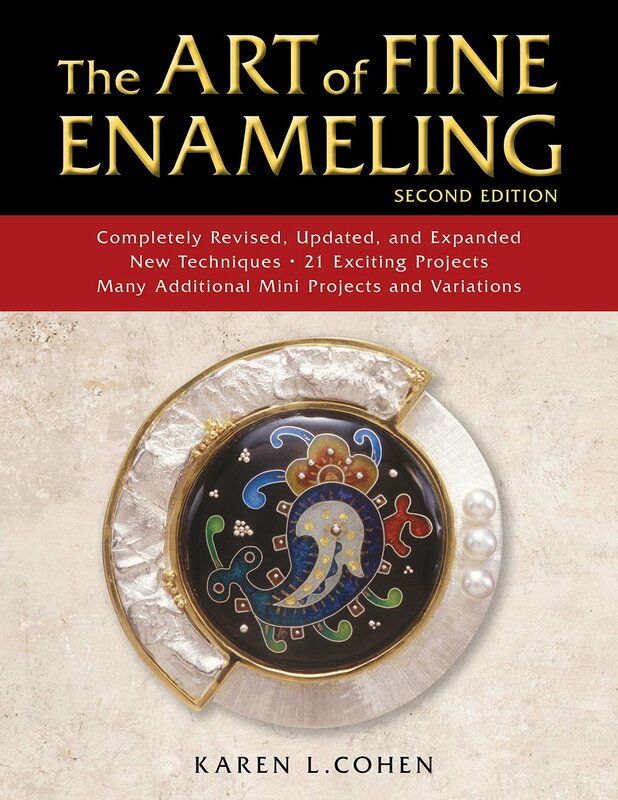 In the author’s first book, The Art of Fine Enameling, published in 2002, she explored this world as it was then, but so much knowledge has been gained in the last 17 years that it was definitely time for an update. Every chapter and project has been completely reviewed, revised, and updated; it’s a whole new book, and one you will want in your reference library. The look and organization is updated, 15 years of experience has been added, about half the projects have changed, and two types of mini-projects to expand your learning experience are included. In addition, each project has a gallery of the work of other artists working in the same technique, to give a view of other ways a technique can look and be used. Classic techniques such as champlevé, cloisonné, and plique-à-jour each have projects, as do newer approaches such as the use of graphite pencil and enameling on steel—21 project lessons in all.